Inflatable concentrators are helium-filled balloons used to collect the sun's energy. Each balloon can produce approximately 1 kilowatt of energy. How do inflatable concentrators work? Inflatable concentrators are suspended between poles and are supported by cables. The concentrators capture sunlight and focus it onto photovoltaic cells. The sun’s heat activates the electrons in these cells, generating an electric current. The cells will produce some current as long as there is some sunlight and will function even when it is cloudy. However, no electricity is produced at night. What are the benefits of using inflatable concentrators? Since inflatable concentrators are suspended in air, no land is being used for energy production leaving the space beneath the suspended concentrators available for other uses. The current-producing process generates no pollution. The balloons can withstand wind speeds of up to 100 miles per hour. 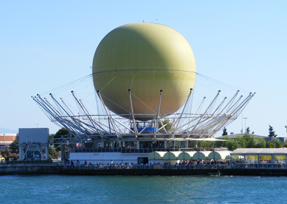 As opposed to a solar panel that is limited by its 2 dimensions, the spherical shape of the balloon provides a higher likelihood of light penetration. The helium gas in the balloon is environmentally friendly. What are the economic advantages of inflatable concentrators? The balloons are easy to transport. There is minimum maintenance required since the balloons can stay afloat for up to one year before needing to be serviced or replaced. One balloon costs around $4,000, as opposed to an investment of $10,000 for traditional solar cells. When compared to conventional mirrors used to collect solar energy, the design for inflatable concentrators costs 400 times less per collected area. The use of inflatable concentrators will significantly reduce the cost of solar energy to the point where it will be in direct competition with energy sources based on fossil fuels. What is the main disadvantage of inflatable concentrators? The primary problem with inflatable concentrators is that the balloons are insulated with silicon to reduce leakage. Silicon is in short supply and may need to be replaced with a suitable alternative in the future.